At Buds Office plants our florists use a mixed selection of seasonal fresh cut flowers to create beautiful modern, contemporary and classic arrangements to suit all office environments. Delivered to your office each week, prices start from £35 including delivery. Our florist will also be happy to provide fresh flowers for one off events and special occasions for staff and clients. Bespoke flower service. 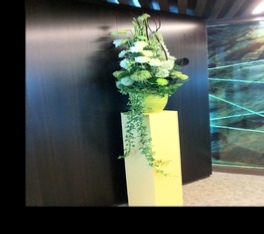 London Floral arrangements to suit your exact requirements and budget. Gorgeous 30cm diameter glass fish bowl internally wound with any colour calla lily and grass. Base layer of clear gel balls and led lights for a little glamour. Great for commercial events and weddings. From £35 plus vat each. Delivery and collection (after event) extra, email us for a quote.